What is the Timeframe of a Landscaping Project? Carrier Lawn and Landscape’s strong suit is efficiency. With more than 30 years combined experience in landscape design and construction, as well as a fleet of heavy machinery on hand (including top-of-the-line dump trucks, excavation and compaction equipment), our team is poised to get you enjoying your new outdoor space as soon as possible. We typically send three employees to be on site for a project, but we also have the ability to pull others if needed depending on the scope and needs of a particular job. We believe that the more bodies to get it done, the better. It’s amazing how much ground we can cover on a good day! We are known to expertly install pavers in a driveway or large patio in only one day. Alternatively, a front-of-house project featuring walkway, steps, edging stones and plants usually takes around 2 full days. It takes an extra day as we’ll typically do the excavation and base work on the first day, and lay the walkway, install plants, fix the lawn and perfect the project on the second. A customer’s pool patio install. 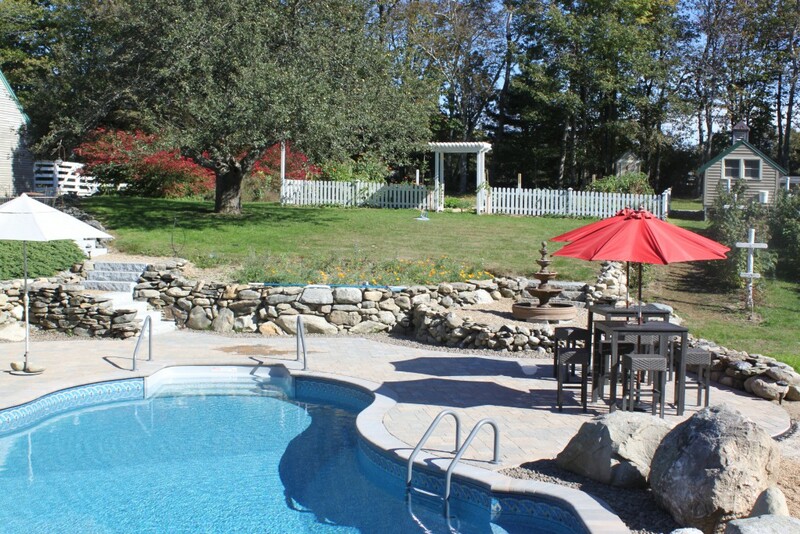 If you’re looking to have a pool patio installed, we aim for completion within a week from start to finish. A paver driveway can take anywhere from three to six days depending on size and logistics. For larger projects involving multiple levels of patio, or a raised patio where a retaining wall is needed, this can take anywhere from two to three weeks depending on the fine details. How can we do it so quickly with such high-quality results? Simple: projects like this are routine for my experienced team of landscape professionals. A smaller company with less equipment and a less experienced team would take at least double the time it takes us. We don’t cut corners, and we bring professionalism and attention to detail to every project we do. We respect our client’s time and space. We are aware that you want a project done and completed in a timely manner and we don’t get offended that you want us in and out of your space as quickly as possible. We get it! Our jobs are priced by the day and we’ll be in and out as agreed upon unless an unforeseen complication comes up that requires extra time. And even then, we’ll be sure to get it solved and perfected in record time.